Queuing for breakfast on a drizzling Sunday morning, I crossed my fingers that the wait would be worth it. Set up with crowded tables amongst gourmet produce, it is half café, half food store. We were seated in the back room, which was still cosy, but slightly less packed than the front. 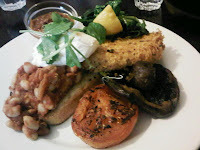 I ordered the vegetarian breakfast which was a handsome serve of baked beans, spinach, mushroom, mustard flavoured chutney, a well seasoned hashbrown and grilled tomato, all topped off with a poached egg. It was a satisfying start to the day. The coffee was also decent. 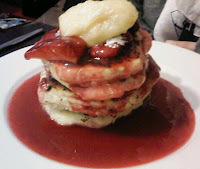 My friends ordered the ricotta hotcakes, which were equally substantial served with strawberries. With its popularity, this is not the type of place where you can sit for hours enjoying conversation or the weekend paper. Your table will be handed over to the queuing group as soon as it has been cleared. The prices are not cheap, but perhaps standard for the area.